Good news for Hackers and Bug hunters! 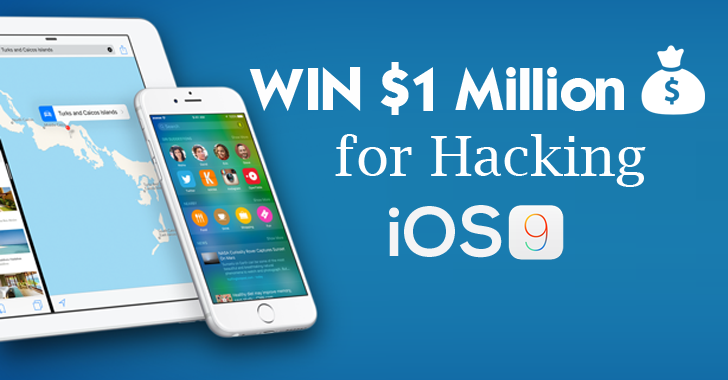 You can now WIN 1 Million Dollars for finding zero-day hacks for iPhones and iPads. This Huge Bug Bounty is offered by the new Security firm Zerodium, a startup of the infamous French-based Security firm "VUPEN", who is well known for buying and selling zero-day vulnerabilities. Zerodium, which describes itself as "the premium zero-day acquisition platform," announced a total of $3 Million ($3,000,000) bounty bounty rewards for iOS exploits and jailbreaks. "The whole exploitation [or] jailbreak process should be achievable remotely, silently, reliably, and without requiring any user interaction except visiting a webpage or reading an SMS [or] MMS," Zerodium says in a blog post. However, the vulnerabilities in Airdrop, Bluetooth, NFC, or baseband would not qualify. Also Read: For Better Privacy & Security, Change these iOS 9 Settings Immediately. The bug bounty program is valid and open until October 31st, 2015 at 6:00 p.m. EDT, and or until the firm ends up paying the total promised payout of $3 Million to researchers and developers.